#014: Peach pink rainbow : Nail of This Week. 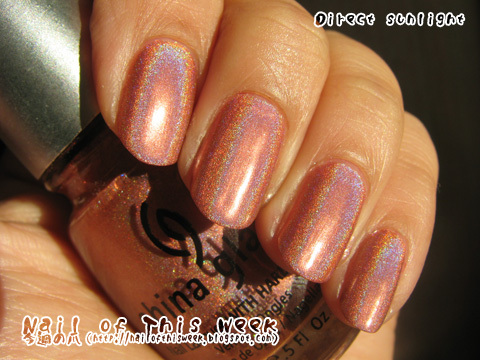 Today's post is not about this well-known holo but the basecoat. After I got nice result with Jessica’s Retro Revival Basecoat, I simply wanted to try other holo polishes with this nice aqua-base basecoat. I grabbed TTYL from OMG collection, simply because this and FYI is only the classical “eye-catching but hard-to-apply” holo I have. Because Retro Revival didn’t fill my nail ridge, I started with my usual basecoat to smooth up the nail surface. I then gave one thin coat of Retro Revival, then TTYL…and it worked very well! Actually Retro Revival was my first aqua base and it was one great reason I desided to buy Hologram Chic set, so I’m pretty happy to see that this basecoat made my holo-life really easier than before.